Last week I was approached by Gym Junkies to be part of an article in which I and other health and fitness bloggers describe their top 3 favorite exercises with a little reasoning behind each of them. 1. Barefoot beach sprints. I ran 80-100 miles a week for years, but I feel more like a true runner just doing one set of these each week (and no other running except when I “play”). Nothing beats the flat, hard sand at low tide with the sun just coming up to make me feel connected to everything. Speed, baby. If you’ve been living the Primal lifestyle for a while, you know that there are tons of natural, healthy foods available. But, what if there was more out there? 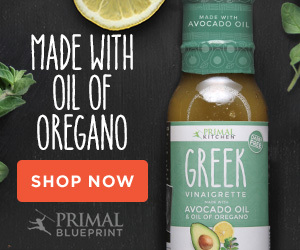 Primal-approved foods that you haven’t tried? As a newbie to MDA I’m interested in doing the Primal Challenge for the year. I’m sold on the idea of PB and understand how it should work. The problem is I’ve had one failure after another when it comes to diets, and I’m a little gun-shy going in. The PB is definitely different than diets I’ve tried in the past. I just want to feel prepared this time for the stumbling blocks and know what to look out for. I’d love to hear your advice and tips! I’ve been hearing from a lot of new folks since the New Year’s Primal Challenge. Thanks for your comments and questions. I’m thrilled you’ve all joined us! Do me a personal favor by following this link and selecting “Six Until Me” as the Best Patient’s Blog of 2008. My friend Kerri runs this great site and I think she deserves to win (check out her site and judge for yourself or just take my word for it). And check out her husband’s fitness site, I Look Like Fit, while you’re at it. You may remember the misguided buzz about low carb diets affecting short term memory, but what about high sugar diets affecting long term memory? Did you eat too many Christmas cookies? Having a hard time overcoming that holiday weight gain? The good folks over at NPR explain how overeating effects the body. As you may know, at the core of the Primal Blueprint is gene expression – the idea that our genes can be “switched” on or off, or influenced into producing varying amounts of proteins based on environmental factors (like diet, exercise, and exposure to toxins). In fact, the Primal Blueprint is designed around maximizing positive expression and minimizing deleterious gene expression, the idea being that the best way to express our genes is by living like our Primal ancestors. Eating clean, whole foods, getting plenty of exercise, mental stimulation, and sleep – these are the ways Grok lived (if he was lucky), and these are the methods by which our genes are best influenced. And it’s not just conjecture. Time and time again, science (read: unbiased, unaffiliated observations on the human condition) has suggested precisely the same thing about environmental effects on the way our genes work. It’s the middle of winter and – in most parts of the country – it’s bitterly cold. Whereas most people turn to “comfort” food like heaping bowls of mashed potatoes or platters of mac and cheese in the winter months, those of us living Primally must approach things a little differently. We can’t take solace in the grains and beans that fill so many stomachs with empty calories and regressive nutrition, and that provide the “full” feeling that people seem to enjoy (I don’t know about you guys, but it just makes me feel bloated and useless).